Christmas is all about eating, drinking and being merry. In my and Taylor’s second year at the ‘Taste of Christmas’ at ExCeL London Docklands on 6-8th December, there was much merriment and coffee drinking on their wonderfully festive stand. 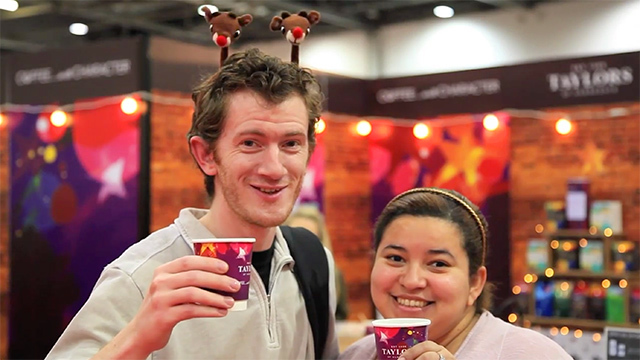 In this videoblog, I captured London’s foodies sampling Taylors coffees with the season’s compliments. The Christmas Blend was causing quite a stir as were two new Coffee Selections and the brilliantly simple and clever Aeropress coffee maker. The Taylors crew and I had a lovely time meeting some real characters, chatting about flavour, sharing tasting notes and their coffee knowledge with everyone who attended. Shot in one day in 1080 HD video and edited in Final Cut Pro.